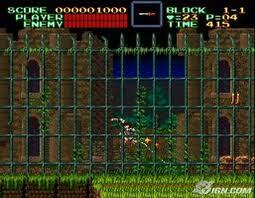 Castlevania is another series like Mario, Zelda and Megaman that has been around since the days of the NES. Its playstyle has morphed a few times, the first being a 2D action platformer in the days of the NES and SNES, to a style that fan's have dubbed Metroidvania to currently a style the is similar to the God of War playstyle where you can attack with lightning fast combos. 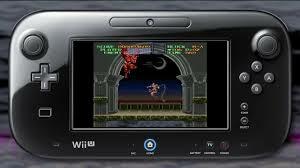 Now while the playstyle's may have split fans on the which game is the best in series many will agree that the pinnacle of the 2D platform style is Super Castlevania on the SNES, which is now available on the Wii U VC. Now while storywise this game doesn't offer anything new, it even goes as far as many people agree that this is a remake of the first game in the series. 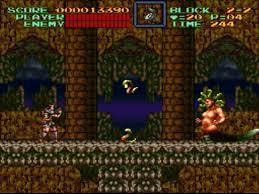 You are legendary vampire hunter Simon Belmont charged with the slaying of Dracula. 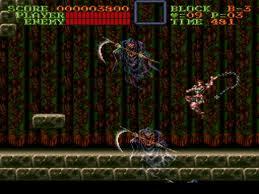 On your way to the famous showdown you will face off against the classic Castlevania enemies, skeletons, zombies, bats, carrion birds and of course the most famous staple of Castlevania enemies, flying Medusa Heads. You go through a variety of stages, from a stable in the Castlevania country side, to a trip down a raging river whipping the evil minions of Dracula in standard platform fashion but along with that you have some points that remind you you are playing a Castlevania game like using your whip to latch on to rings to help you swing across bottomless chasms in true Indian Jones style. At some point in the level you will come across an elite minion of Dracula such as a skeletal knight on a skeletal horse or Medusa which using the tricks you have learned you must survive and defeat to advance onto the next level. Of course since this is Simon's first 16 bit outing the graphics and music are a vast improvement over the 8 bit chip tunes of the NES Castlevania, which is to be expected. However how well the music fits the mood of the game and how well it is done on this early of a 16 bit game is truly unexpected. From the moment you take your first steps toward Dracula's castle you are treated to a haunted melody that truly sets the stage. As you go in the music ramps up making you feel the urgency of your mission and that you are the only one that can stop Dracula. Later on a chilling melody with a harp makes you really feel the despair in a cavern. The music even holds up to this day as some of the best music to come out of the 16 bit era. Now along with the music the graphics are a really mood setter as well. Again right away as you start you will notice the eerie fog effects roll in as you approach the castle gates. Later on the graphics of a dark and eerie forest again helps set the mood that you are alone in the Castlevania country side. Of course these are just a small sample of the graphics what really makes it shine is the spinning room made possible by the effects of Mode 7. Again like the music the spinning room effect still holds up to this day and is still praised by people who have just played the game for the first time. As far as character sprites go well again they are some of the best the SNES has to offer. From Simon to the lowest skeleton minion, the sprites are some of the biggest character sprites I have seen on a SNES game, which makes this game super indeed. As for gameplay, that is the really difference maker here. Before this game people were use to Simon or in the case of Castlevania III Trevor being able to whip in front of themselves, now however it seems that Simon took some whip lessons cause now not only can Simon whip in front of him but now he can whip in all eight directions which is very helpful, so helpful in fact that at times it seems to be the best weapon for any givin situation and at times I forget I have a subweapon. Along with swing the whip in eight direction Simon has another handy trick and that is by holding down the attack button Simon will make the whip go limp. By continuing holding down the attack the limp whip will cause it to become a sort of a shield which is handy for blocking fireballs or other projectiles. Also if you press the directional button while holding down the attack button it will cause Simon to fail the whip around him which is weaker then the swing but handy enough when you dont have the room to swing your whip. Now while it is very useful the new whip tricks it does for some make the game a bit easier, for example if you have an skeleton patrolling a ledge above you you can just whip right above you to kill it rather than having to be on the same level as it and putting you in harms way. Swinging your whip around like a fail is great for the patterns of the flying Medusa heads. If there is a downside to this game its that there can be some cheapshots that can lead to an untimely and annoying death. Whenever Simon takes a hit, he will bounce backwards a bit, and doing that to near a ledge or some spikes will cause an instant death, which some players will call foul at. Also while climbing up or down stairs Simon cannot do anything but go up and down the stairs so if an enemy comes along you are forced to take the hit which again can lead to some frustration. Another thing is at times your jumps and swings need to be precise. For example in one of the early stages there are some rotating platforms that will flip when you land on them causing you to fall in a bottomless pit. If you dont hit the jump button at the precise moment you land you are dead, even if you are a split second late. However the jumps will be minor annoyances to any first time players, once you figure out the timing its pretty much smooth sailing from there. The good thing though about playing this on the Wii U VC is the fact that the Wii U has restore points so, some of these cheapshots can be avoided by using them. Whether you are an old school Castlevania player or someone who was introduced to the Castlvania line through the Metroidvania era or someone who was just introduced by Lord of Shadows this is one Castlevania you dont want to miss. 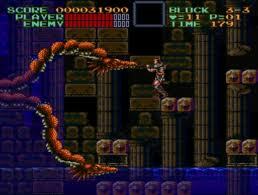 Not only is this the pinnacle of the 2D Castlevania but its can also be a pinnacle of the SNES's power at the time. It may have been one of the first SNES games but graphic and music wise it holds up to this day and they really set the mood for a Castlevania game. While the many will claim Symphony of the Night is the best Castlevania one will find it hard to argue that this isn't the best 2D platformer Castlevania. Even with the annoying cheapshots and deaths it will be well worth the playthrough. Nice review dude. Thanks for posting this one so quickly. Not a problem wanted to do it yesterday as a Halloween treat but I got called into work at the last minute. You keep reviewing games right after they are released you're such a hard working colleague. I love reading your reviews Tasuki chan! Nice review Tasuki and just a day after the Wii U version was released too! This is the only game in the Castlevania series that I ever enjoyed lol. Your review is very nicely written @Tasuki. Um...I really like your review Tasuki!